Filing tax returns electronically gets more popular every year—now over 90% of tax returns are filed online.1 Which software will work best for your business? Perhaps you’re a veteran of the tax software debates on TurboTax vs. H&R Block. Or maybe you’re a business owner who’s ready to make the switch from a personal tax preparer to software. Or maybe you’re a new freelancer wondering if tax software has more benefits than just filing it yourself. Finding the tax software with the right features will help you file on time, file correctly (audits aren’t fun! ), and get a better tax return, putting more money in your pocket. Here’s our take on the five best tax software options for small businesses, with a runner-up included as well. TurboTax offers plenty of valuable features, but its greatest value it its reliability. With a clear and comprehensive approach to tax filing, business owners can trust TurboTax to answer their questions and maximize their returns. TurboTax Self-Employed costs $119.99, while TurboTax Business costs $169.99. You’ll also pay $44.90 for state filing. Is TurboTax right for my business? You have doubts about which deductions to claim for maximum profit. You worry about mistakes and want to cover any holes in your return. You want a streamlined system for your business to make the filing process easier and faster. You want to save money when filing. TurboTax ticks a lot of boxes. It’s easy to use and helps you file quickly. The software’s user interface makes sense and guides you through the process smoothly—and if you still need help, one-on-one support will soon be on the way. And its guarantees (including a maximum refund guarantee) provide peace of mind that you’ll file taxes in a way that benefits your business most. That said, the features and reliability definitely come with a cost. If you’re self-employed or freelancing, you could save some money with a cheaper service if you already know which tax deductions to claim. The more complicated your business is, the more attractive an option like TurboTax becomes. If your business has a lot going on, we recommend H&R Block to ensure you have every last bit of support you need. For some small businesses tax filing is a relative breeze, but not every business is so lucky. Maybe you have a lot of tough deduction decisions to make, or perhaps your company needs additional software for accounting or HR. Software costs for businesses range from $74.95 to $89.95. Filing online as a business has a wider range, from $69.99 to $104.99. Additional resources like Xero or Tax Pro Review cost extra. Is H&R Block right for my business? You have a complex set of itemized deductions and expenses to deal with. You want to consult someone on some of your decisions. You think you might miss out on some of your deductions without help. You have straightforward freelance or self-employment income. You want the cheapest filing option possible. There are two major circumstances where H&R Block’s services will benefit your business. The first circumstance is if you worry whether your small business is maximizing every advantage possible. Thanks to online chats with professionals and the option for pros to sign off every last inch of your return, you can rest easy knowing that you did right by your taxes. Second, H&R could work great if you are also looking for accounting support in addition to help with filing taxes. Through a partnership with Xero, you’ll have several accounting tools that should smoothly integrate with H&R Block when tax season comes around. But some businesses might not use all those features—in that case, investing in H&R Block would just be throwing money away. If you know which deductions you can claim, or if your business just doesn’t have that many direct expenses, there are cheaper options for filing. Liberty Tax’s mix of on-site and online tax preparation options might be the right fit for some businesses that are just starting out. Why lean on experts when you can become the expert yourself? Liberty Tax’s Tax Education School, which offers online and classroom tax courses, is a unique feature that helps tax novices gain tax know-how. Beyond their unique branding—if you’ve seen someone twirling a sign dressed as Lady Liberty on a sidewalk, it was likely for Liberty Tax—most of Liberty Tax’s features are fairly standard. For a business, you’ll need at least the Deluxe edition, which costs $64.95. More complex businesses, like S corporations, might require the Premium edition for $89.95. Is Liberty Tax right for my business? You want to take its tax education courses. You feel more comfortable with the option to meet face-to-face if needed. You don’t need too many extra features. You definitely want to file from your computer only. Liberty Tax’s unique features don’t benefit you. Similar to H&R Block, Liberty Tax combines brick-and-mortar storefronts with online offerings. That combination might appeal to some small-business owners, especially anyone who is just starting out. For most people, face-to-face contact works best when working out a tricky tax situation. This makes the online-to-office filing transition especially appealing. In contrast, if you don’t see yourself visiting in-store or attending the tax education courses, there might be better options at both lower and higher price points. Liberty Tax’s interface and features are pretty standard, and the price is average as well. If you have a self-employed business and sitting down to finally do your taxes fills you with dread, eFile does a lot to make the process as painless as possible. While eFile.com has a mixture of useful features, its quirky sense of humor and personable approach to taxes stands out. Businesses will need to buy the premium edition for $39.95. If needed, the fee for unlimited states returns will be $23.95. Is eFile.com right for my business? You feel like some humor and diversions might motivate you to file. You aren’t sure what features you’ll even need from your tax software. You’d like to do some basic number crunching before you file. Your business is not a pass-through entity and needs to file Form 1120. You could benefit from eFile.com if you own a pass-through business, even if you don’t appreciate their more light-hearted approach to filing. Their pricing structure is direct and affordable, and several basic filing features are covered. However, some might find the website unprofessional, and some of the pop-ups and menus make navigating the site difficult. Since you can’t fill out Form 1120 on eFile.com, you’ll need to find another option if your business is registered as a C corporation. If you’re okay with fewer features, FreeTaxUSA’s unbeatable cost makes it a great fit for any small businesses looking to file taxes as cheaply as they can. FreeTaxUSA’s appeal is obvious from its name alone. You can file your federal taxes for free, and a state return will cost you $14.99. The Deluxe upgrade adds a few features, like amended returns and priority support, for $6.99. Is FreeTaxUSA right for my business? Your business is simple self-employment or freelance work. You want the cheapest filing option available. You need little to no support to fill out your tax forms. You need to file Form 1120 for a corporation. You plan on having lots of questions during the filing process. FreeTaxUSA will work perfectly for freelancers and other people who file as sole proprietors. You don’t need to spend any extra money on unneeded features, and if you happen to be in a state without income tax, you might file absolutely free. But this online filing service won’t work at all for more complex businesses. Many business tax forms are unsupported. FreeTaxUSA might also be a poor fit if you need help with questions as you file—its support options and help features aren’t top of the line. We also took a look at TaxAct, tax preparation software that offers many features at a reasonable price. TaxAct is the Toyota Corolla of tax software: affordable, straightforward, and well-rounded when it comes to the benefits it offers. So what are those balanced benefits? You can generally expect all standard features—plus a few nice bonuses—with the TaxAct software. 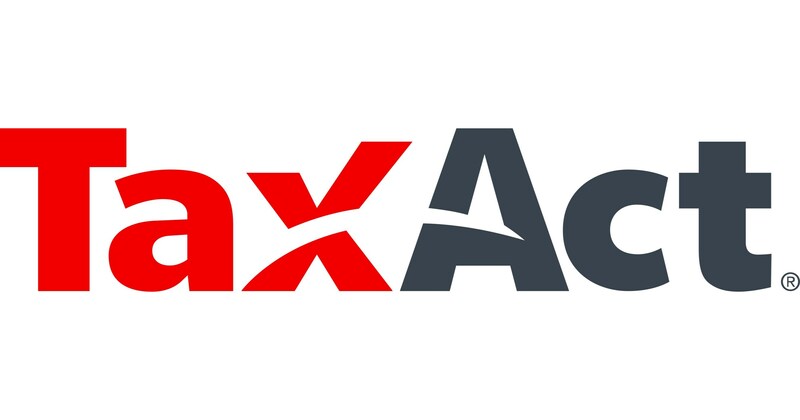 TaxAct helps you file a single return, no matter what type of business, for one price: $69.95. They also sell a Self-Employed+ edition with extra features for $77.95. Is TaxAct right for my business? You have a larger business but want a cheaper filing price. You want the comfort of one-on-one support with a tax expert. You value a range of additional features. You want a cheaper filing option for simpler businesses. TaxAct is a great middle-of-the-road option for businesses who want a few extra features, such as tax expert support, for a reasonable price. If you or your business is already familiar and happy with TaxAct, you shouldn’t feel pressured to change. If nothing about TaxAct immediately grabs you, your business might want to find an option that either offers more support and features, like TurboTax and H&R Block, or a cheaper price, like eFile.com and FreeTaxUSA. If you’re looking for the best tax rates for your business, these states lead the pack. They say the only things we can be certain of are death and taxes. There’s not a whole lot you can do about the former, but when it comes to taxes, a range of factors determine how much you’ll pay. For business owners, these factors can be key to the profitability and long-term success of the company. One of the most important factors in determining taxes is location—in the case of business owners, where you own and operate your business—and some states’ business tax rates are friendlier than others. Of course, making sense of the ins of outs of state-by-state taxes can get complicated. So we at Business.org partnered with MoneyDoneRight.com and set out to make it a little easier. 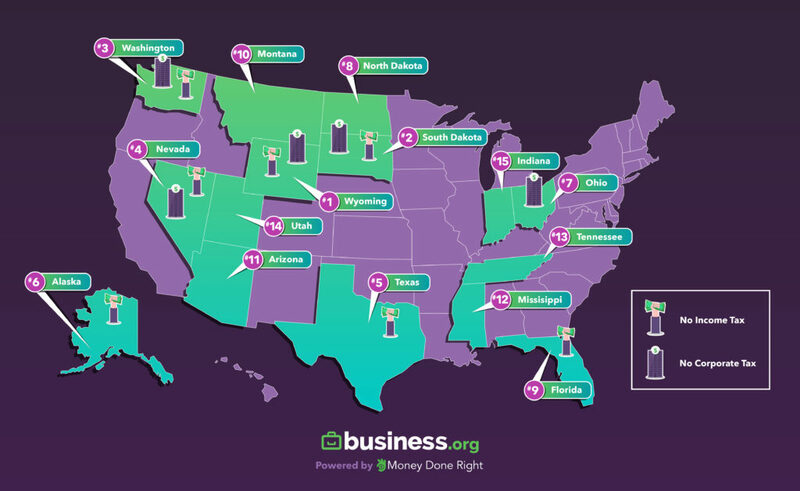 After plenty of research and data crunching (you’re welcome), we’ve determined the top 15 states for businesses come tax season. Some of the states in our top 15 make a whole lot of sense. In places with fast-developing startup communities, such as Washington and Texas, it checks out that those states would incentivize business owners with favorable tax conditions. Some states, such as Alaska and Florida, have no income tax, while others, like Ohio, have no corporate tax. The sweet spots—and all of our top four picks—have neither corporate nor income tax, making it a winning situation no matter what kind of business setup you have. At first glance, you might also be surprised by some of the states on our list. Plenty of rural states, like Ohio, Arkansas, and the Dakotas, made it into the top 15. But on another level, it makes sense: if you’re someone with an online business, settling down away from bustling startup ecosystems could be an attractive option—and make tax season a breeze. Here’s another surprise: Even in states that ranked well in every other factor, sales tax can sometimes be an issue. For example, Nevada is a great state for service-based businesses, but for those selling goods, the 6.85% sales tax rate can be a bit steep. That said, most of these top 15 states offer tax situations that are optimal for most business owners, whether they sell goods or not. Each state has its own tax rates for different types of companies, so determining the best tax situation for your business might take a little comparison. But if you’re looking to find the most tax-friendly state for your business, this top 15 is a great place to start. All data was gathered by MoneyDoneRight.com and analyzed in conjunction with Business.org on a state-by-state basis using 2019 tax rates. Business.org ranked the top 15 states, as determined by MoneyDoneRight, based on a set of factors including income tax rates (lowest and highest), corporate income tax rates (lowest and highest), state sales tax rates, and state average property rates. Looking for some more tips on picking the perfect software for your small business? With so many features offered by even the simplest software out there, it can be tough to narrow down what you need while checking prices at the same time. A tax software with the right features will help you file on time, file correctly (audits aren’t fun! ), and get a better tax return, meaning more money in your pocket. It might make sense to put features first—after all, any gains from a correctly filed return tend to outweigh the price difference from product to product. But don’t just “ooh” and “aah” over an impressive list of capabilities and extras. Instead focus on the features you know you’ll need. Then find the cheapest product that still gives you everything your business requires. Take a look at your business plan and make sure your legal structure, products, services, and staff will all work with the tax program features you choose. If you don’t have an official business plan, consider creating one before choosing your software. You’ll also need to decide whether you’re using tax preparation software mostly for personal income taxes or for business taxes. The biggest shift from personal to business taxes is probably the shift of responsibility. With personal taxes, a lot of the tax preparation falls on the shoulders of your employer. Generally, you just fill out a relatively short form once a year and claim the proper refund. But if you own a business, you need to know a bit more and you need to prepare a bit more. Depending on what type of business entity you registered, you’ll need to track a variety of forms and deadlines. For typical full-time employees, the employer withholds taxes from an employee’s paycheck. That means many employees look forward to a nice tax refund as a reward for filing. But with business taxes, you probably shouldn’t expect a refund unless you overpay on your quarterly filings. For both personal and business taxes, it’s important to keep solid records of your finances. However, personal returns have more restrictions when it comes to tax deductions. Since so many business expenses are tax deductible, keep those business receipts if you want those deductions. One key difference between filing personal and business taxes will be the various forms you need to complete. Different business entities each use different tax forms—we’ll give you a quick rundown here. If your small business isn’t registered as a legal entity, you should fill out a Form 1040, which is your personal tax return. As part of your 1040, you’ll also need to complete the Schedule C portion, which allows you to report the income and expenses from your sole proprietorship. These same forms will also work if you registered your business as an LLC with you as the sole member. What if you’re not running a solo gig? Every member of a partnership, LLC, or S corporation will need to fill out Form 1065 and a Schedule K-1. Each of these business organizations pass through business income to the owners or shareholders, so the members will need to account for those earnings under Schedule E in their personal income taxes. Unlike the organizations above, C corporations do not pass through income to the business owners. These businesses file their corporate taxes using Form 1120. If you’re a business owner, you should get a Form 1099 to inform you of the income you made from the business for your personal return. Different situations will require extra forms, like a Form 720 for excise taxes (necessary if you sell items like tobacco, alcohol, or gasoline) or Form 941 for taxes withheld from paychecks. As the complexity of your business grows, you’ll probably need more powerful tax software to keep up with all the required filings. After years of ignoring taxes until April tax season comes along, switching to a quarter-based tax schedule can be jarring. Depending on whether you have employees or what goods you sell, you might not have an option. If you pay employees, then those Form 941s will need to be filed quarterly. Likewise, Form 720, used for excise taxes, will also need to be filled out every three months. Unsure if you’ll need to report excise taxes? If your business plans on selling items like tobacco, alcohol, or gasoline, you are required to charge excise taxes and will need to file those earnings. Outside of those categories, you have the option of making quarterly payments or a single year-end payment to the IRS. Many businesses choose to file quarterly based off an estimated return. But if you’re willing to set aside money for one large payment, you can simply pay at the end of the tax year. That wraps up our list of the best tax software for small businesses. Whether you found the perfect software to fit your unique situation or chose the reliability of our overall winner, TurboTax, you can rest assured that tax season will be less stressful with the right kind of help. Check out our guide on filing taxes as a small business for even more tips.